Artisans in a Colombian border town are making handbags and other curios with bolivars as annual inflation is so high that Venezuelans can no longer afford the basics. CUCUTA, Colombia –– Venezuela’s currency has become virtually worthless, making it better used to turn colorful bolivar bills into a purse than to spend them on a purse – or anything else. 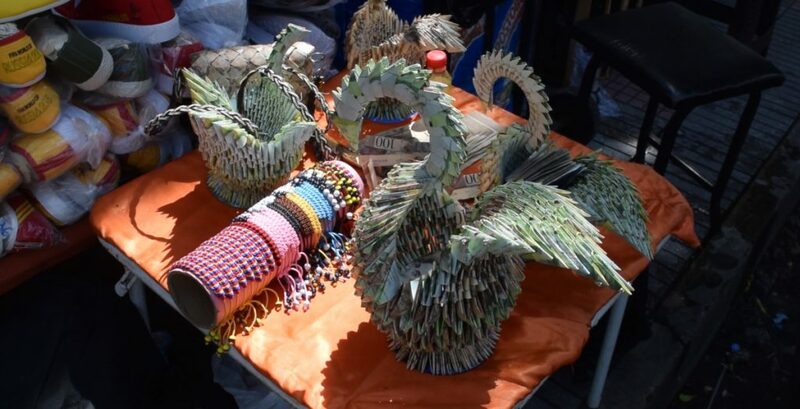 So that’s what Alvaro Rivera and other artisans in one Colombian town along the Venezuelan border are doing – using the once mighty bolivar as raw material to make handbags, bird sculptures and other curios. The largest handbag Rivera sells on the streets of Cucuta is painstakingly woven from 1,000 individual bills totaling 100,000 bolivares. The value of that cash at money exchange houses in Cucuta is 17 U.S. cents. The bag, on the other hand, sells for $13. Venezuela’s economic collapse has been so deep that it plays out in ways that defy the imagination. The Central Bank has stopped publishing most economic data, but Venezuela’s congress says annual inflation hit 24,600 percent in May. That’s as if your bag of groceries, which cost $15 a year ago, now costs $3,960. And as prices have soared, wages and the currency haven’t kept pace. While goods in dollar terms are cheap in Venezuela, those earning bolivares can no longer afford the basics. To feed a family of five for a month costs 20 times the monthly minimum wage, according to the Center for Labor Research and Analysis a Caracas-based nonprofit. The crisis is forcing millions of people to flee the country, often to neighboring Colombia, to escape hunger and get their hands on any currency other than the bolivar. In Cucuta, more than 20,000 Venezuelans cross the border every day, some leaving for good and some just hoping to earn a few pesos. Anderson Gutierrez, a 45-year-old orthopedist from Caracas, has spent the last three months prowling the international bridge doing odd jobs. On a recent weekday, he was trying to persuade Venezuelan women to sell their hair to Colombian wigmakers. On a good day, he makes about 50,000 Colombian pesos in commission, or about $18 – a fortune if he takes it across the river to San Cristobal, Venezuela. Scrambling to keep up with the runaway prices, Venezuelan President Nicolas Maduro has increased the minimum wage three times this year alone. Now the basic monthly wage is 1 million bolivares. At the official exchange rate, which few people have access to, that salary is equivalent to $13. But on the black market, where most people are forced to exchange their money, it’s less than $2. Another mind-bending aspect of Venezuela’s crisis is that while bolivar bills are essentially worthless, they’re also incredibly hard to find. According to Bloomberg, the government no longer has enough money to buy money. And so most merchants now rely on bank transfers for even the smallest payments. Velasquez says paper money has become so scarce that it’s selling at a premium. If you want 100,000 bolivares in your hand, for example, you have to transfer 250,000 bolivares to the seller’s account. The reason the bills are prevalent in Colombia and along the Venezuelan border but harder to find in Venezuela’s interior is a product of market forces. As Venezuelans leave their country, they often exchange their savings in Colombia for pesos, or another currency, to continue their journey. Merchants along the border then use bolivares to buy Venezuelan toothpaste, mayonnaise, gasoline and other price-controlled goods that can be resold at huge markups in Colombia. Girish Gupta, a former journalist and the founder of Data Drum, a website that collects and analyzes economic data from Venezuela and other countries, says the government’s figures provide clues to the crisis. While the administration can’t afford to print or import physical bills, it’s creating electronic money at rates seen nowhere else in the world, he said. In the past year alone, Venezuela’s monetary base – a combination of all the physical and electronic money in circulation – has increased 6,222 percent, according to Central Bank figures. And over the past three years it has increased a staggering 50,000 percent. By comparison, the United States’ M2 money supply (a broad measure of money in circulation) increased 3.7 percent in the past year.